Aerial view from Lakones down to town and bay of Paleokastritsa and Paradise beach at Liapades (Corfu Island, Greece). Paleaokastritsa, Corfu / GREECE May 31 2018: tourist boats coming into bay of Paleokastritsa, Corfu Island (Greece). Landscape and tourist spot. Aerial view of the Bay of Paleokastritsa at Corfu Island (Greece). Forest around the coastline. Clear Water. Liapades, Corfu / GREECE May 24 2018: Paleokastritsa at the Liapades bay on Corfu Island (Greece). passing by with a boat the hotel building on a rock. stairs leading towards the water. boat trip from Paleokastritsa towards Liapades beach at Corfu Island (Greece). passing by sediment chalk rocks in the water. Cliff coast with forest. Aerial view of the Bay of Paleokastritsa town at Corfu Island (Greece). Forest, houses and the coastline. Boats driving around at the lagoon. Liapades, Corfu / GREECE May 24 2018: boat trip from Paleokastritsa towards Liapades beach at Corfu Island (Greece). passing by sediment chalk rocks in the water. Cliff coast with forest. Blue eye cave at Corfu island (Greece). being with a boat at the blue eye cave at Paleokastritsa. typical light blue reflection in the water of cave. Paleokastrisa, Corfu / GREECE May 24 2018: Cityscape of Paleokastritsa on Corfu Island (Greece) and its Lagoon. People bathing in the water. Flight over ocean sea water surface Paleokastritsa bay rocky coast cliff. 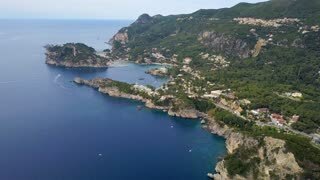 Greece Corfu aerial 4k travel video.